(Top) Richard and Cathy Overdorf enjoy Bangladeshi food. 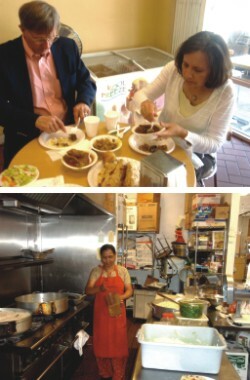 (Bottom) Chef Shakini Begum Concocting Sumptuous Dishes. Living in the Antelope Valley has its advantages. There is almost no rush hour traffic, no crowds to fight and a population of only half a million people. But it also has its disadvantages a lack of quality international cuisine and shopping. It is a diverse place but not enough to include a Bangladeshi restaurant. When I miss my country and crave anything Bangladeshi, I get in my car and drive 100 miles to Little Dhaka. It's not a city or part of a city. It is a mere restaurant/grocery store in a suburb of Los Angeles called Artesia. But it is sufficient to satisfy my craving for some food and ambience of back home. There are regular addas and the friendly co-owner Manju Ashraf Hussain is extremely hospitable. In these tough economic times, he still maintains a smile and is optimistic that these tough times will pass. Especially since a lot of his clientele is from out of town from as far away as San Diego and Las Vegas. His Los Angeles clients also provide business but it's hard in these times of economic uncertainty. In the strip mall where Little Dhaka exists I noticed three empty store fronts a sign of three failed businesses. But Manju remains optimistic. I for one hope Little Dhaka stays afloat, where else could I experience a slice of Dhaka. The food is home-style and the cook Shakini Begum has been cooking dal, bhat, bhuna gosh, niramish and more, for the last 6 years. Her parathas are also sumptuous. And of course the wide variety of misht will satisfy anyone's sweet tooth. Little Dhaka not only caters to the Bengali palate. Richard and Cathy Overdorf, residents of Palmdale, California comment approvingly, “The meat is very tender” and the parathas remind Richard of a similar item called sopapillas from New Mexico. Cathy likes the food so much that her interest to visit Bangladesh has peaked. And Little Dhaka is located in a neighborhood with several sari shops, jewellery shops and close to a multi-cultural movie theatre showing the latest Bollywood blockbusters. So a visit to Little Dhaka can be the mere beginning of a day of getting in touch with our eastern roots.